As we move forward into the second decade of this century, most of us are re-evaluating our stewardship role of the world and how we can personally utilize our resources more wisely while reducing both impact and waste. To this end, Green Building, Natural Building, Green Architecture and Sustainable Building are all being defined and refined as we work towards solutions that benefit all. GR Plume Company is sincerely focused on the integration of Sustainable Building practices with the real world demands of the construction industry. 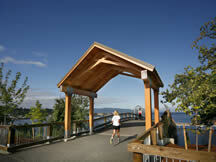 In the 1990’s GR Plume led the way for reclaimed timber in the Pacific Northwest. As a Board member of West Coast Lumber Inspection Bureau, Gordon Plume personally spearheaded a new grading rule for reclaimed timbers in which bolt holes were graded the same as knot holes in new timbers. 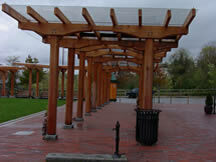 Since then, millions of board feet of reclaimed timbers have become nutrients for new projects. 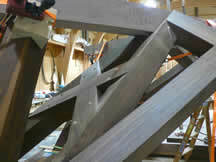 Today our focus continues to be on maximizing the timber we use. We believe that conscientious logging and milling practices (for example FSC-certified wood products) combined with thoughtful uses can produce a more than acceptable life cycle assessment (LCA) of the environmental impact of using timber in today’s buildings. When considered over its’ complete life cycle-from extraction to disposal-wood outperforms other building products for overall environmental impact (the Cradle to Grave measurement). In the past few years we have seen a significant change in stakeholders expectations and sustainable characteristics are now becoming an integral goal of most projects. To this end we continue to develop processes that maximize our yield while acknowledging the design parameters set by the Design Professional. 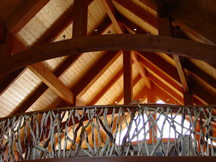 One of our Manufactured Products, Tetraleaf Veneered Glulam, can combine FSC (Forest Stewardship Council) certified Glulam cores with carefully chosen sawn veneers. 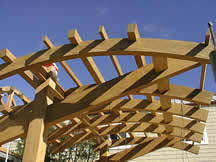 In this fashion, one excellent piece of timber becomes the exterior of many, thus reducing the quantity consumed yet providing the warmth and beauty of wood members. In some cases, it is also possible for the veneer stock to be FSC certified to fully complement the need for sustainability. In addition, our glue of choice is a Polyurethane Emulsion Polymer (PEP) by Ashland which is water-based and has much lower VOC levels than the recommended ceiling for structural wood members per LEED initiative EQ Credits 4.1. The fear and concern about the impact on the world by the level of consumption and waste generated is legitimate. We are convinced that it is possible to make the necessary changes and still be able to make sound building choices that fulfill both our responsibilities to this earth while enriching the human experience. We can reduce the environmental impact of our buildings, provide healthy inside spaces and reduce the long term energy costs by changing our individual expectations and behaviors. GR Plume Company is dedicated to community involvement and we strive to make a significant effort to support our neighborhoods. Through in-kind, volunteer and financial support we believe it is imperative to give back to those special projects that need help. Robin Plume, as a board member of the Northwest Workforce Council and long time employer, sees first hand the need to focus on Youth and job training. Drop-out prevention, exposure to the trades, hands-on experiences are all part of GRPC’s committed focus on youth. As a dedicated craftsman and Rotarian, Gordon Plume participates in many local, community projects. A strong believer in hard work and physical participation, he often offers “on the job training” to other members of the volunteer team when building some of these projects. 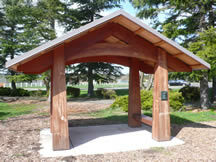 Collectively, the Plumes also donate benefit events in Robin’s garden. Filled with structures designed and built by Gordon, surrounded by a lush Northwest garden interspersed with tropicals and hot house specialties, members of the community come together to contribute for the greater good. We’ve Got Wood! 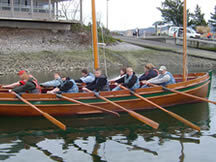 GRPC has sponsored a Ski to Sea Team for many years. 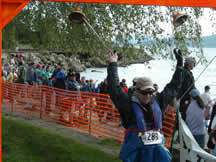 A 90 mile relay race that encompasses seven different sports, Ski to Sea is a favored event in Bellingham, Washington. GRPC, along with sponsoring a team, has long participated in various ways to help with the reclaimed wood for the team plaques.